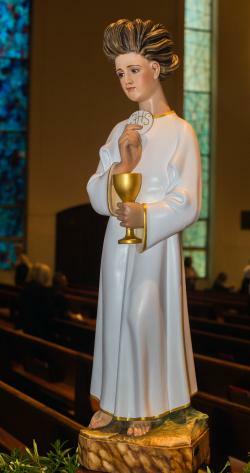 Angel of Fatima statue on display at the back of St. Michael Church during the April 4, 2019 commemoration of the centenary of the deaths of St. Francisco and St. Jacinta, the shepherd children who received apparitions from the Virgin Mary in 1917. 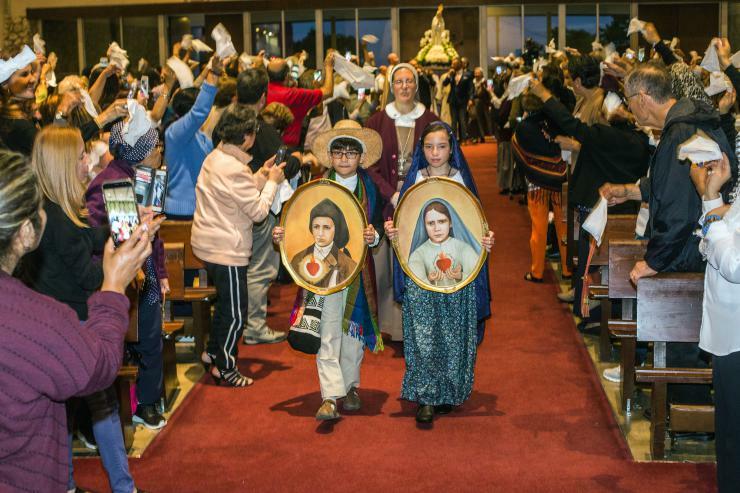 Luciano Garzon, 10, and Mariana Canedo, 10, dressed as the shepherd children St. Francisco and St. Jacinta, enter St. Michael Church followed by Sister Grace Heinrich of the Servants of the Pierced Hearts of Jesus and Mary. 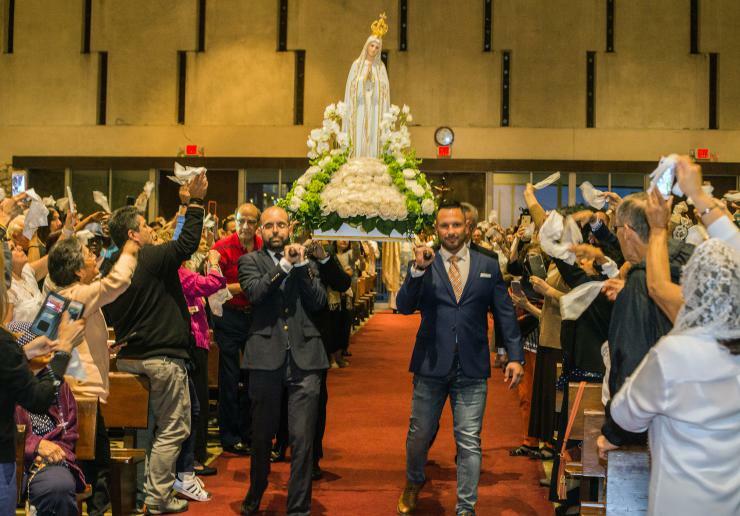 Men carry a statue of the Virgin Mary into St. Michael Church as the congregation greets it by waving white tissues. Worshippers pray a Rosary for World Peace during the service making the centenary of the deaths of St. Francisco and St. Jacinta, the shepherd children who received apparitions from the Virgin Mary in 1917. Father Joseph Rogers holds up a relic of St. Francisco during the commemoration of the centenary of the deaths of St. Francisco and St. Jacinta, the shepherd children who received apparitions from the Virgin Mary in 1917. 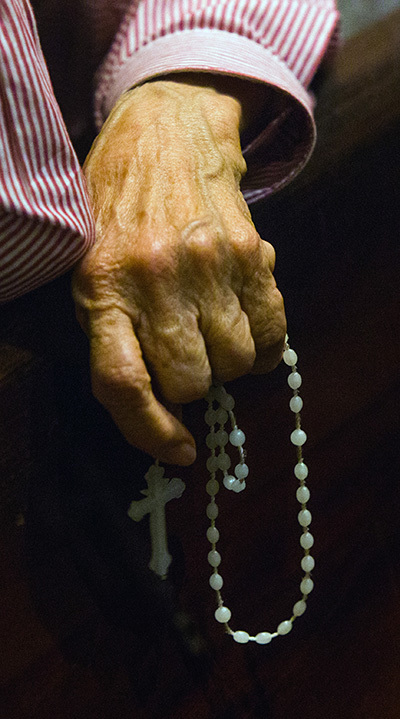 Laura Contrera holds up a rosary and prayer card of St. Francisco and St. Jacinta as Father Joseph Rogers blesses religious articles during the commemoration of the centenary of the deaths of St. Francisco and St. Jacinta, the shepherd children who received apparitions from the Virgin Mary in 1917. 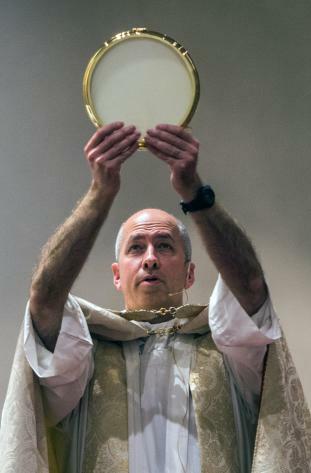 Father Joseph Rogers holds up the Eucharist during the commemoration of the centenary of the deaths of St. Francisco and St. Jacinta, the shepherd children who received apparitions from the Virgin Mary in 1917. 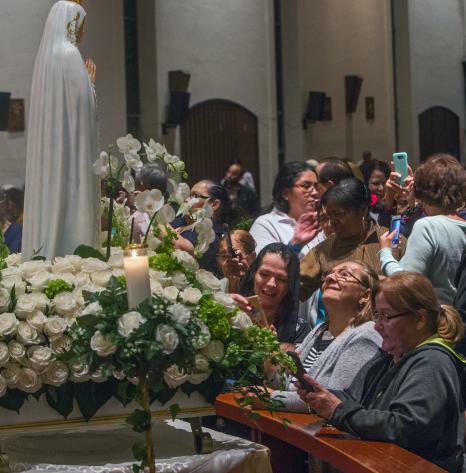 Worshipers pray and take photos of Our Lady of Fatima statue after the service, which launched a year-long commemoration of the centenary of the deaths of St. Francisco and St. Jacinta, the shepherd children who received apparitions from the Virgin Mary in 1917. MIAMI | On a recent weeknight, Luciana Barnabei drove from her west Broward suburb to St. Michael the Archangel Church in Miami to attend a service. The service commemorated the centenary of the deaths of two shepherd children who witnessed apparitions of the Virgin Mary at Fatima, Portugal, in 1917. 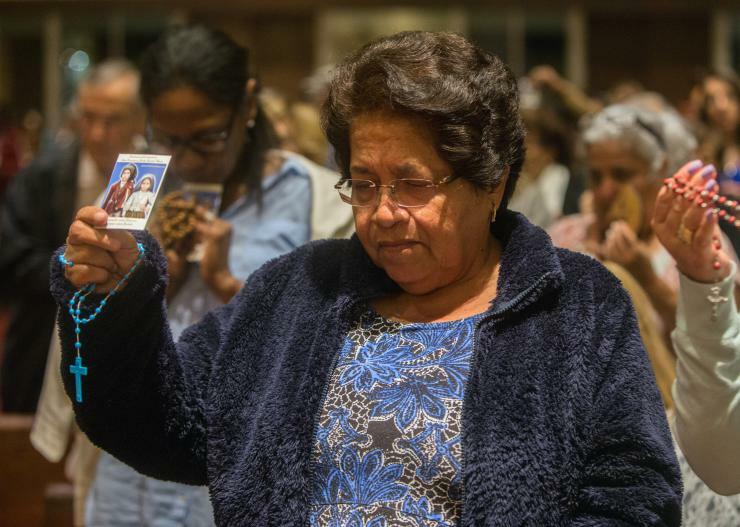 “I believe in the Fatima apparitions and I believe that when you pray the rosary we are saving the lives of unborn babies that might have been aborted, and we are converting souls,” said the Weston resident. Worshippers pray a Rosary for World Peace during the service making the centenary of the deaths of St. Francisco and St. Jacinta, the shepherd children who received apparitions from the Virgin Mary in 1917. 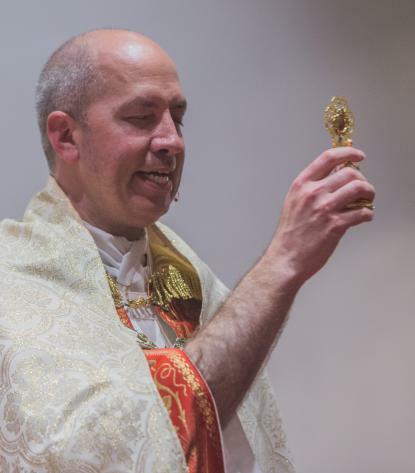 Father Joseph Rogers holds up a relic of St. Francisco during the commemoration of the centenary of the deaths of St. Francisco and St. Jacinta, the shepherd children who received apparitions from the Virgin Mary in 1917. Barnabei was one of the worshippers who packed the Flagler Street church April 4 for a Mass, prayer of the World Rosary for Peace, adoration and consecration to the Immaculate Heart of Mary, in commemoration of St. Francisco and his sister, St. Jacinta Marto, who received messages from the Virgin Mary. Those at the service received a prayer card with photos of Francisco and Jacinta on the front that said, “Contemplate like Francisco” and “Love like Jacinta.” A prayer of Fatima’s Angel of Peace was printed on the back of the card. The children were victims of the Spanish influenza pandemic in 1919 and 1920. Their cousin, Lucia dos Santos, also witnessed the apparitions and later became a nun. The coordinator of the centenary project, Father Hector Alfonso Ramirez, asked Mother Adela Galindo, founder of the Servants of the Pierced Hearts of Jesus and Mary, to organize centenary services in the Americas. “I sent out instructional materials to bishops in the United States, Nicaragua, Guatemala, El Salvador, Paraguay and Uruguay about organizing services within their dioceses,” said Mother Adela. Don Rui Marto, pastor of the parish in Fatima, is promoting the project with the collaboration of Father Carlos Cabecinhas, rector of the Shrine of Fatima, and the approval and blessing of Don Antonio Marto, bishop of Leiria-Fatima. Starting in the late 1930s, Sister Lucia began to publish memoirs of the Fatima events and recounted secrets that the Blessed Mother revealed to her and her cousins. On June 13, 2017, Our Lady said Francisco and Jacinta would be taken to heaven soon, but Lucia would live a long life in order to spread her message and devotion to the Immaculate Heart of Mary. On July 13, Our Lady revealed the first secret, a vision of hell, and asked the children to pray for the souls there. The third secret is said to refer to the assassination attempt on Pope John Paul II’s life, May 13, 1981. He credited Our Lady of Fatima with saving his life. Pope Benedict XVI has said that the third secret of Fatima not only referred to the attempted assassination of Pope John Paul II, but that its significance could be extended to include the suffering that the Church is going through today as a result of the ongoing reports of sexual abuse. Pope Francis canonized Francisco and Jacinta on May 13, 2017 at a Mass in Fatima. The decision followed papal confirmation of a miracle attributed to the intercession of the two visionaries. Father Joseph Rogers, a Washington, D.C. diocesan priest, celebrated the Mass at St. Michael and preached the homily. He is part of a new initiative by the Servants of the Pierced Hearts: the establishment of a male branch of their religious order. He said there are five men in the preliminary stages of discernment to be priests or brothers in the order. Mother Adela said the Servants will organize another ceremony for the closing of the centenary on the 100th anniversary of St. Jacinta’s death, Feb. 20, 2020. Luciano Garzon, 10, and Mariana Canedo, 10, dressed as the shepherd children St. Francisco and St. Jacinta, enter St. Michael Church followed by Sister Grace Heinrich of the Servants of the Pierced Hearts of Jesus and Mary.